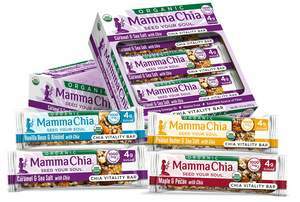 CARLSBAD, CA--(Marketwired - Dec 15, 2015) - Mamma Chia, the pioneer of the chia revolution, is launching a new line of Organic Chia Vitality Bars with just four grams of sugar! Each lightly-sweetened bar is a tasty anytime snack that delivers the powerful nutrients of chia in a great-tasting quartet of delicious new flavor combinations. These yummy bars are great for an on-the-go breakfast, packed in a healthy lunch, tucked in a gym bag for a pre- or post-workout snack, or anytime you need to power your soul's purpose. These organic, perfectly-balanced bars combine nutrient-rich chia seeds with almonds, peanuts, pecans, quinoa, popped sorghum, brown rice crisps, and a touch of sea salt. Plus, there's just enough sweetness to create a truly delightful treat that's good for your body yet tastes like a secret indulgence. Each nourishing bar provides 1000mg of Omega-3s, as well as protein and at least four grams of fiber. With a suggested retail price of $1.79, these new Organic Chia Vitality Bars are available in four purely enjoyable flavors: Caramel & Sea Salt; Vanilla Bean & Almond; Peanut Butter & Sea Salt; and Maple & Pecan. The bars, along with all Mamma Chia products, are Non-GMO, gluten free, Kosher and USDA Certified Organic. "Our new Chia Vitality Bars provide a tasty and nutritious option for members of our community who are conscious of their sugar intake," said Janie Hoffman, Mamma Chia founder and chief executive officer. "These flavor-packed bars taste so delicious that folks may find it hard to believe they only have four grams of sugar." Mamma Chia's new line of organic Chia Vitality bars will be available at select retailers including Target and Safeway. Mamma Chia is a conscious and sustainable company with a mission to share the Magic of Chia through delicious, nutrient-rich, organic foods and beverages powered by chia. Founded in 2009, Mamma Chia is a category innovator and maker of the first-to-market chia beverage, as well as the Chia Squeeze Vitality Snack, Chia Granola Clusters, Chia Vitality Bars, Clean Energy Beverages and Chia & Greens Beverages. Mamma Chia was created by founder and chief executive officer, Janie Hoffman, in the kitchen on her small rural farm outside of San Diego. Selected as a 2015 NEXTY Award winner, 2014 Breakout Brand by Beverage World and named 2013 Best Retail Brand by Nutritional Outlook, Mamma Chia is a Certified B Corporation, a member of 1% for the Planet and a founding member of Slow Money. Mamma Chia donates one percent of sales to support farmers, community groups and organizations that build healthy, local food systems. Mamma Chia is available in mainstream grocery stores and natural food markets in the United States, Canada and other countries full of chia lovers. For more information, visit www.MammaChia.com.